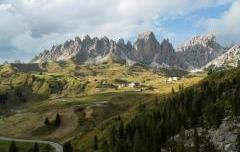 Well visible to the east of San Martino di Castrozza is a platter of beautiful gray limestone. From San Martino with Colverde cable car, at the finish line, follow a path that is not very visible in the direction of the 20min wall. Otherwise from the departure gondola parking lot walk along the track and for easy vertical debris channels under the wall 60 min. Attack in the center of the wall the correspondence of an obvious grotto with large boulders on the ground the 1st shot is a monotyr 6a Sx - 6b + right. Recommended 2/3 small medium friend, kevlar lanyards to reinforce stops or possible rappel.